I decided to go ahead and start a thread to post about the movies I'm watching for this marathon. I've decided on a few titles, but I'm not sure for all of them yet. Even on this quiet tree-lined street, no one is safe...especially from the savage killer next door. Welcome to Disturbia, "a cool thriller with big scares" (Richard Roeper, EBERT & ROEPER). Living under three months' house arrest, Kale Brecht (Shia LaBeouf, Transformers) passes his days spying on the neighbors. It's all fun and games until things take a horrifying turn for the worse. Kale is convinced his neighbor next door is a serial killer – but he can't prove anything, can't convince anyone and can't leave his house without triggering an alarm. Enlisting the help of his friends, Kale is determined to expose the truth – but have they all taken on more than they bargained for with a cold-blooded murderer on the loose? With nowhere to run and nowhere to hide, Kale and his friends are in a race for their lives in this electrifying thriller that will keep you on the edge on your seat. When I first saw the trailers for this one, I thought it looked like a more modern version of Rear Window. Seeing the movie just reinforced that idea. Even though the story borrows heavily from Rear Window, I still enjoy this one and think it is worth watching. After watching Rear Window in the last few days, I decided to watch this one again. The story is very entertaining even though it isn't the most original. Nothing is in the credits to say the movie is based on Rear Window or inspired by it, but I think it is very clear that the story has borrowed from the earlier movie. Kale is confined for a different reason and he has a bigger area to move around in, but he ends up watching the neighbors too. He resorts to that after his mom cuts off his XBox live and actually cuts the cord to the tv in his room. He becomes convinced that a neighbor is a killer and 2 friends end up trying to help him prove his theory. There is a good amount of mystery to what is going on and a few scenes are very suspenseful. I do think the movie works as an updated version of Rear Window, though it isn't as good as the earlier movie. Most of the movie is set in Kale's house, though some things do take place in other areas. Even with the other locations, most still takes place in the immediate neighborhood where Kale lives. A few scenes are very suspenseful and a few creepy things happen as well. One scene clearly illustrates why it is a good idea to keep the doors locked and windows up in a car..especially if you happen to be following someone you think is a killer. This isn't an action packed movie, though some action does turn up in a few scenes. A little violence turns up in a few scenes as well. That stuff does help to keep things interesting since some of the scenes do move slower. The characters are fine, though not overly interesting. Kale acts like a jerk at first, though it is sort of understandable given that he is still dealing with his dad's death. It would have been nice if Kale had been a more likable character. I also think he does some stupid things. When he is watching the neighbors, he is always sitting in a room with a bunch of lights on. He would clearly be visible to anyone who glanced in the direction of the window he is using. Even after he has a scare about someone maybe catching him watching - before he is watching the guy he is sure is a killer - he still doesn't turn the lights off when he focuses on watching who he thinks is a murderer. He should have had enough sense to turn the lights off as a precaution against being seen. I know that is a minor thing, but it bugs me. Shia LaBeouf does well with the part. Ashley and her family move into the neighborhood after Kale is stuck on house arrest. She joins Kale and his other friend, Ronnie, in watching the suspected murderer. Both of them are fine, though nothing special. David Morse is wonderful as Robert, the neighbor Kale believes is a killer. He is charming when needed and flat out creepy, freaky, and scary at other times. Carrie-Ann Moss turns up a few times as Kale's mom. She is concerned about what is going on with her son. Overall, I really enjoy this movie and think it is worth watching. I did write a review on Epinions a few years ago after I saw the movie on HBO. I always liked Disturbia too! A desperate solution for a troubled country: Lex Luthor for president with the Justice League in the service of the government. Only Batman and Superman stand against the new regime - and their disloyalty proves to be exactly what Luthor intended. Using their outcast status to instigate a scandal against Superman, Luthor finally tastes a victory in his vendetta against the Man of Steel. 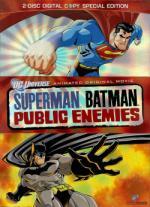 From Executive Producer Bruce Timm and voiced by the cast from both hit Batman and Superman animated TV series including Kevin Conroy, Tim Daly and Clancy Brown, this DC Universe Original Animated Movie based on Jeph Loeb and Ed McGuiness's popular graphic novel seethes with Political intrigue and action-packed battles between heroes all believing they're on the right side of the law. This is the 6th animated straight to video movie made featuring characters from DC comic books. The animation is done well, though nothing about it stands out as great. The story for the movie is taken from the Superman/Batman comic book. I've never read the comic book, so I have no idea what has been changed for the movie. I'm guessing some things have been. The story of Luthor being the president and being able to go after Superman is interesting. Unfortunately, I don't think the movie dealt with the subject as well as it could have. There isn't enough attention to the story itself and how the main characters are handling certain things. There is nothing in the movie about how things impact Superman's life as Clark. Lois is only barely mentioned and is only briefly seen at the very end of the movie. That just seems like a waste to me. I think the movie would have been stronger if the story had received more attention. There are many fights throughout the movie. The fights are done well enough, but there are so many of them, one right after the other, that they start to blend together. There is too much attention given to all the fights at the expense of the story. All the fights do get a bit old after a while. For most of the other characters involved in the fights, I don't know who they are. I think they are more minor characters from the comic books, but I don't know for sure. There are just too many characters popping up in this one. It would have been better if the cast of characters had been smaller..then the characters could be more developed. Several of the people providing voices for this one have done voices for the characters before, in the animated series for Batman and Superman. The actors all do well with the voices for the characters. I did enjoy the movie overall, though I do think the story could have been stronger. I did get a review posted on Epinions earlier tonight if anyone would like to take a look. The highly acclaimed director of Finding Nemo and the creative storytellers behind Cars and Ratatouille transport you to a galaxy not so far away for a new cosmic comedy adventure about a determined robot named WALL•E. Experience the exciting animated hit film with theater-quality sound and the most pristine picture available on Disney Blu-ray Disc. After hundreds of lonely years of doing what he was built for, the curious and lovable WALL•E discovers a new purpose in life when he meets a sleek search robot named EVE. Join them and a hilarious cast of characters on a fantastic journey across the universe. Transport yourself to a fascinating new world with Disney•Pixar's latest adventure - unsurpased on Blu-ray Hi-Def. Loaded with bonus features, including the all-new animated short "BURN•E," this 2-disc set overflows with fun for the entire family. I thought I had posted about this one here before, but I can't find it if I did. So my Pixar marathon continues with WALL-E. I loved the movie when I first saw it and I still love it. Presto is the animated short that played before the movie. This one features a magician having some problems with his rabbit. It is a bit more silly than some of the other Pixar shorts, but I really like it. I think the silliness works perfectly for it. WALL-E is probably the most different movie Pixar has made. The main character is a run down robot who can only say a few words. For most of the movie, there isn't any dialog. I wasn't bothered or bored by that aspect of the movie and think it works perfectly for the story. WALL-E is one of the most expressive characters I've ever seen. He displays more emotion than many human characters in other movies. The relationship that develops between him and EVE is really sweet. I love when they are basically dancing through space around the ship. That scene is beautiful. The story for the movie isn't that complicated, but it ends up working very well. Time is taken to set up the situation and make it clear that WALL-E is alone except for cockroach friend. He's been doing his job for hundreds of years and is the only robot left still working. Things start to get a bit more complicated once EVE shows up and starts running tests. The story does have a bit of a message, but I think it is delivered without getting preachy. Some of what happens is more serious, but there are a lot of funny moments. Many of the things that made me laugh are tied to WALL-E trying to figure out what things are when he finds different things, like a fire extinguisher. He is fascinated by items he finds and hauls some of it back to the trailer that is his home. It is so cute when he starts showing EVE different things from his collection. Robots - at least those two - find bubble wrap irresistible too. The animation is amazing. All the piles of trash look very realistic. There is this...haze hanging over the city that impacts the look of things. Everything on Earth has a sort of dirty, worn out look. EVE and the ship have a more streamlined and sleek look, which emphasizes the contrast. The images of space look amazing. 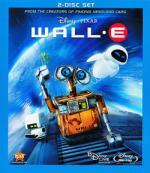 After picking up some of the other Pixar movies on Blu-ray, I decided to get the Blu-ray of WALL-E too. The picture quality is absolutely amazing. More details in the background are visible. The different textures for some things really stands out. I never noticed how reflective EVE was before. The movie looks gorgeous on Blu. I didn't watch the extras, though it looks like they are the same ones that were on the DVD version I have, including The Pixar Story. The animated short BURN-E is really cute and it ties in with the movie. This is a wonderful movie that definitely deserves to be seen. I did post a review on Epinions back after I saw the movie in the theater. 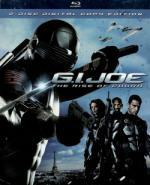 Prepare for non-stop action and thrilling adventure when you go inside the high-tech world of G.I. Joe in this 2-disc Special Edition. I ended up seeing this one in the theater after it had been out a while and I enjoyed it overall. The movie has problems, but it works as a fun, entertaining action movie. It is based on the toy line and the various characters have also been featured in comic books and a cartoon. I watched the cartoon all the time when I was younger. I have forgotten just about everything. Maybe I would have had more issues with the movie if I remembered more. There is a decent story, though it could have been a bit stronger. It does serve as a bit of an origin story showing how Duke and Ripcord join the Joes. The beginnings of the group Cobra is also shown. There are a few twists introduced into the story that help to keep things interesting. Flashbacks are used to share some important information. They do slow the flow of the movie a bit, but the information shared is really needed. The action scenes are the main focus of the movie. They are very well done, though they do go over the top. The movie is supposed to be set in the future, though not that far into it. The weapons and various technology things do have a futuristic look to them. They do seem to be things that could be developed. I think the sound effects for at least some of the weapons is very much like what was used for the cartoon, though I may be remembering wrong. There are a lot of action scenes in the movie, and that does take time away from developing the characters. The violence isn't extreme, though it might bother some viewers. None of the characters are developed enough. There are too many of them popping up for that to happen without the moving being much longer. Thanks to the flashbacks, a few characters are a bit more developed and shown to have a more complicated back story than I had expected. The cast is fine in their parts without anyone really standing out. I think I ended up enjoying the movie more this time than when I first saw it. When I first saw it, I was more aware of all the negative reviews and watching closer for issues. This time, I just watched it to enjoy it..and I did. The movie has problems, but it works as an entertaining mindless action movie. I did post a review at Epinions after I saw it in the theater...I thought I had posted here too, but I guess I didn't. Discover the intriguing inside stories of why so many of Britain's most celebrated stars took roles in the series. See the newly unveiled screen test between Daniel Radcliffe and Evanna Lynch (selected to play Luna out of 15,000 hopefuls!) Go on the set to see firsthand how each of the directors brought unique strengths to the series. Witness the amazing transformations as Daniel, Rupert and Emma grow with their characters over a decade of unprecedented filmmaking. I have no idea how many times I've seen this one now, though this is the first time I've watched the Blu-ray version. I love the movie - though I don't care for the snake parts...and the basalisk still freaks me out even though I know it is CGI. What can I say...I'm a wimp. All the spiders don't bother me at all though. This is a good adaptation from the book. There are changes, but they aren't huge and don't irritate me to no end like seems to happen more and more with the later movies. The story is a little more complicated and definitely darker in tone than the story of the first book/movie. Voldemort comes across as a bigger threat and there seems to be more danger. A bit more about just how powerful a wizard he was comes out. I think this one is a lot darker than the first movie - and book - but this is mild compared to what is coming. The violence is mild and things are really scary, though some children may find a few things scary. There is a decent amount of humor added in as well, much of it provided by something Ron says or does. I think the way he reacts to the spiders is really funny. Though if I was in a situation with real spiders like he was in the movie, I would have freaked way more than he did. The characters of Ron, Hermione, and Harry are growing and developing and becoming more complex. The actors are doing better with the parts too. They are starting to become a bit more mature, which fits since they are dealing with more serious issues. Hermione shows again how intelligent she is and what a power witch she is becoming by figuring out that potion as a second year. She does other things like that in the later books that have unfortunately been cut from the movies. The new characters are wonderful and the casting for them is perfect. Lockhart is such an insufferable dolt and Kenneth Branagh does a great job with the part. Doby is done very well as is Lucius Malfoy. With the way Lucius acts, it becomes clearer why Draco is the way he is. I watched the extended version of the movie this time that has about 17 more minutes. There are just little differences here and there. I wasn't sure about all of the changes until I watched the deleted scenes. The main new extra lasts about an hour and 20 minutes and is focused on the characters. There are interviews with a lot of the cast about their characters. Daniel Radcliffe, Rupert Grint, and Emma Watson are shown the most. The casting of different characters through the sixth movie is covered. The directors talk about some of the casting as well. Not all of the characters are covered. It would have been nice if more of them had been mentioned, though that would have made the extra a lot longer. None of the characters who will be introduced in the last movie are talked about, though at one point, I'm sure I saw Luna's father in the footage playing. Since nothing tied to the last movie is brought up or even hinted at, it does make this featurette or documentary - whatever - feel unfinished to me. The movie has held up very well and is still enjoyable to watch. Harry, Ron, and Hermione already look different from the first movie. I'm so glad that the cast has stayed the same through all the movies. It just wouldn't have been the same if some of the parts had been recast. 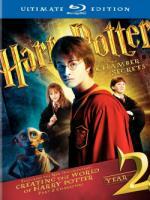 This Ultimate set is wonderful and something that Potter fans will enjoy. I did post a review on Epinions after I saw the movie in the theater in 2002. I have thought about updating the review, but I haven't gotten to it yet. The spectacle begins when massive spaceships appear in Earth's skies. But wonder turns to terror as the ships blast destructive beams of fire down on cities all over the planet. Now the world's only hope lies with a determined band of survivors, uniting for one last strike against the invaders – before it's the end of mankind. I saw this one in the theater at least twice, though I'm thinking it might have been 3 times. At that time, the dollar theater was still open. Anyway, I also got the movie on VHS and I have no idea how many times total I've seen the movie. This was the first time I'd watched it in a while, but I still enjoyed it overall. Things get off to a slower start while all the characters are introduced and the situation is set up. For much of the movie, it jumps around from character to character, showing what each of them are up to. Even once most of them are in the same place, the movie still jumps around. That does get a little annoying, though it mostly works for what is going on. Because there are so many characters to deal with, none of them are that developed. Most of them are rather flat actually. It would have been nice if there had been more development for the characters. The cast is good and does fine with their parts. There is a lot of action throughout the movie. The action scenes are done well for the most part and I think they have held up well. Some of the action is a bit over the top, but that is to be expected for this type of movie. The action ends up receiving more attention than the characters or the story. The violence isn't that extreme or graphic, though the movie really isn't a good one for younger children. The story of aliens showing up is interesting, though I don't think it is handled as well as it could have been. Some aspects of the story do seem to be pulled from the original V..at least the look of the ships and how they hover over large cities is very much the same. Much of what happens is predictable, especially if you have watched many of this type of movie. It does seem like the director has used this one as a template for some of his later movies - The Day After Tomorrow and 2012. Those movies have a very similar structure and the same type of characters in general. Really the only difference is how the world is being destroyed. I think the elements worked better in this one. Independence Day has some issues with being predictable and having flat characters, but the movie is entertaining overall. It is a decent disaster type movie. I did get a review posted on Epinions if anyone would like to take a look. From the creators of Cars and The Incredibles comes a breakthrough comedy with something for everyone. With delightful new characters, experience Paris from an all-new perspective, and savor a gourmet high-definition experience on Blu-ray Disc®. In one of Paris' finest restaurants, Remy, a determined young rat, dreams of becoming a renowned French chef. Torn between his family's wishes and his true calling, Remy and his pal Linguini set in motion a hilarious chain of events that turns the City of Lights upside down. Experience Ratatouille for the first time with revolutionary clarity and spectacular audio enhancement. It's a rare treat you'll enjoy again and again. 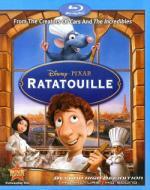 I finished up my Pixar binge with Ratatouille - I've remembered how to spell it again. I first saw the movie in twice in the theater and I still love the movie. The short, Lifted, is very cute and entertaining and I really enjoy it. The plot for Ratatouille is very entertaining and having a rat want to be a chef is definitely different. Rats aren't usually thought of as being that cute, and they are definitely not welcome in kitchens, but somehow, it works for the movie. The movie deals with the idea of following dreams and has a message that is handled well. There really isn't any mystery or suspense to the story, though I was surprised by some of the developments. Some of what happens is slightly predictable, but I don't think the movie is predictable overall. The character of Remy is wonderful and he's very likable. Humans are around a lot, mostly in the kitchen of the restaurant, but they aren't as developed as Remy. Linguini is a bit of an idiot and he is helpless is the kitchen without Remy. The voice cast works wonderfully with all the voices fitting the characters. The animation is gorgeous and it looks amazing on Blu-ray. When I first saw the movie, I noticed the details in Remy's fur and the water, but that stuff looks even better on Blu-ray. I noticed more little details like I have with the other Pixar movies I've watched on Blu-ray. Many of the surfaces in the kitchen are reflective, and it looks believable. The food, even though it is animated, looks really good and appetizing. The extras on the Blu-ray are focused on the making of the movie and very entertaining. There are still some of them that I haven't gotten to. I'm very glad I picked up the Blu-ray and think this movie, like the other Pixar titles, is a good one to upgrade to Blu-ray. I did post a review on Epinions after seeing the movie in the theater in 2008. Ego eating the first bite of the Ratatouille. The way they show us how he feels is just ingenious. The other cooks walking out when Remy is revealed as the real chef. I also enjoyed the special features. It was nice to see that they weren't the same style as on the other discs, so it doesn't get boring just yet because we're the seeing the same thing over and over again. That moment when he takes that bite is wonderful...almost magical. I agree about that too...it was more predictable that they walked out..though at least she came back. Extras on Pixar movies are wonderful. I'm already looking forward to seeing what they come up with Toy Story 3. Wesley Snipes stars as the tortured soul Blade - half man, half immortal. Blade sharpens his lethal skills under the guidance of Whistler (Kris Kristofferson), his mentor, guardian and fellow hunter of the night. 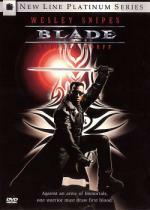 When the bloodthirsty Immortals' lord, Deacon Frost (Stephen Dorff), declares war on the human race, Blade is humanity's last hope for survival. I wasn't aware that Blade was a comic book character until well after I had seen this movie. From what I've read, it sounds like a lot has been changed about the character from the comic book. I can't remember if I rented this one at first or if I saw it tv. The idea of a character that is considered half human and half vampire who hunts vampires is interesting to me. The plot is interesting and makes for an entertaining movie even though it isn't that complicated. Most of what happens is just focused on Blade fighting vampires and Deacon trying to put his plan in motion. Karen trying to come up with a cure is also interesting, though it doesn't get that much attention overall really. The action scenes are done well. The violence does get graphic in some scenes, which could bother some viewers. The characters are interesting for the most part and the cast does fine. I do think this is a good vampire movie that is worth checking out....it just isn't great. 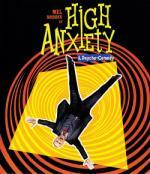 In this outrageous homage to Hitchcock thriller, Mel Brooks plays a renowned psychiatrist who’s just become head of the Psycho-Neurotic Institute for the Very, Very Nervous. Amid strange goings-on at the asylum, the doc is accused of murder, and he must confront his own condition – a paralyzing fear of heights – in order to clear his name. I'm not sure when I first saw this one. I really enjoyed it then even though I hadn't seen all the Hitchcock movies that were being spoofed. Until this last time I watched it, I had just noticed the references to Psycho, The Birds, and Vertigo. I noticed a bunch of other references this time, even going back to The Lodger, one of Hitchcock's silent movies. The story dealing with Dr. Thorndyke becoming the new head of the institute is interesting, though it could have been a bit stronger. A lot of what happens does seem to be just done as an opportunity to poke fun at a Hitchcock movie. That may disappoint some viewers, but I think it works overall and makes for a fun, entertaining movie. There is something a bit darker about this one than the other Mel Brooks movies I've seen. That darker tone works perfectly since the movie is spoofing Hitchcock movies, several of which get rather dark. There is a good amount of humor to what is happening throughout the movie, though this isn't the funniest Mel Brooks movie that I've seen. That may disappoint some people expecting the movie to be funnier. The movie uses some unique shots, something that Hitchcock did in most of his movies. One scene is shot through a fish tank which gives a unique look to the scene. The fish in the tank look like little sharks which fits considering one of the characters involved. Another scene is shot up through a glass table. That is very much like when a glass floor was used in The Lodger to show someone pacing back and forth upstairs. Since that movie was silent, Hitchcock had to find a way other than hearing footsteps to show the pacing. The scene in High Anxiety is a bit twisted though..the characters keep putting stuff down on the table, blocking the camera. There is a funny, if somewhat gross, scene that is inspired by The Birds. The recreation of the shower scene from Psycho is wonderful. The characters are interesting and entertaining. Nurse Diesel is very stern and a bit scary with the way she acts. Cloris Leachman is wonderful in the part. I do like Mel Brooks as Thorndyke. The bellhop, played by Barry Levinson, is only in a few scenes, but he is very entertaining. Madeline Kahn does really well as Victoria, the blonde who gets mixed up in what is going on. The Blu-ray has a very interesting featurette that has Brooks and some of the other people who worked on the movie talking about the movie. Brooks talks about how much he loved Hitchcock movies. He sent Hitchcock the script and got suggestions back. Hitchcock really liked the movie when he saw it. His granddaughter is also shown, talking about how the family enjoyed the movie so much and finding all the references to her grandfather's movies in it. The other extras are a trivia track and a test. The test thing pops up silly questions while the movie plays. I only saw a few of them, but it was kind of fun. I really enjoyed this movie. I do think it is worth watching, though it probably won't appeal to everyone. The Blu-ray has a very interesting featurette that has Brooks and some of the other people who worked on the movie talking about the movie. Brooks talks about how much he loved Hitchcock movies. He sent Hitchcock the script and got suggestions back. Hitchcock really liked the movie when he saw it. His granddaughter is also shown, talking about how the family enjoyed the movie so much and finding all the references to her grandfather's movies in it. Wow, that is kind of impressive.